Galion freshman Marisa Gwinner placed third in the high jump at the OHSAA Div. II track and field championships on Friday at Jesse Owens Memorial Stadium on the campus of Ohio State University in Columbus. Gwinner and teammate Sydney Hunt will compete in the long jump finals on Saturday. 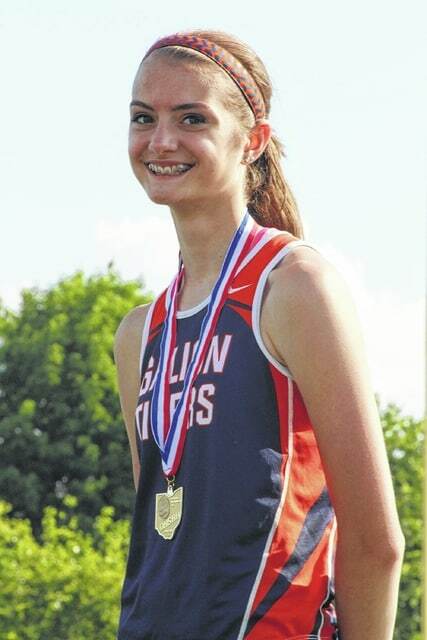 COLUMBUS — Galion’s Marisa Gwinner has enjoyed a fantastic rookie season at the varsity level of track and field, to say the least. The freshman concluded part one of her breakout campaign on Friday at the OHSAA championships, placing third in the Div. II high jump finals. Gwinner topped out at 5 feet, 5 inches to earn a place on the podium at Ohio State’s Jesse Owens Memorial Stadium in Columbus. Junior Paula Wollenslagel of Clyde won the state title after clearing 5 feet, 7 inches. Gwinner edged Wollenslagel to win the regional championship last weekend at Lexington High School. Finneytown’s Yashira Rhymer-Stuart placed second in the event. She also cleared 5 feet, 7 inches, but Wollenslagel achieved the height in fewer attempts. Besides Gwinner, three other freshmen finished in the top eight in the state at Columbus. Julia Smith from Swanton finished fourth (5 feet, 4 inches). Lindsay Bishop of Liberty-Benton and Lilly Ritz of Cambridge were part of a three-way tie for fifth with Chesapeake junior Atiya Spaulding (5 feet, 2 inches). Buckeye Valley junior Emily Hilt finished in eighth place (5 feet, 2 inches). Part two of Gwinner’s freshman odyssey is scheduled to start at 9:30 a.m. Saturday. She and junior teammate Sydney Hunt will compete in the Div. II long jump finals in Columbus. Gwinner and Hunt finished second and third, respectively, at the Lexington regional meet.